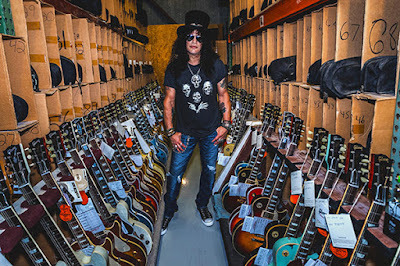 Guns N’ Roses guitarist Slash has been named the first-ever Global Brand Ambassador for Gibson. "It's an honor,” says Slash. “I've been working with Gibson since the early days of my professional career and playing Gibson guitars since before that. I'm proud of the creative relationship we've developed over the years." Slash’s signature sound and epic solos were recorded with several of his favorite Gibson guitars. Over the past three decades, the rocker has collaborated closely with Gibson and the company’s CEO, Henry Juszkiewicz, on several projects including product development, marketing, live events and supporting charitable initiatives with the Gibson Foundation. As part of his new role, Slash has been developing new products with Gibson Custom, Gibson and Epiphone. Slash is currently playing dates across North America as part of Guns N’ Roses’ “Not In This Lifetime” world tour. The summer leg of shows wrap up in San Antonio, TX on September 8, before the group reconvenes for more fall dates starting October 8 in Philadelphia, PA.